An IDEA Pre-K classroom is a great place to learn and grow. Our dedicated teachers track each student’s progress and match instruction to meet their specific needs. Our students have fun learning as they start on the road to success in college and in life! IDEA’s Pre-K program is different and it works. Small learning groups and tailored reading and math programs ensure each and every Pre-K student is learning at a level just right for them. Beyond reading, language, and math, teachers guide Pre-K students through science lessons, field trips, and activities that promote academic and emotional growth. Through community events, parent-teacher conferences, and progress trackers, we work together with families to ensure there is no limit to what our Pre-K scholars can achieve. 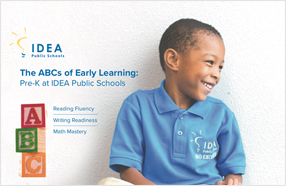 Get answers to questions you may have about Pre-K at IDEA. Read a Q&A with an IDEA Pre-K Parent. Take a Look at a Pre-K Classroom at IDEA.